SixView Manager™ software offers remote management of Sixnet series industrial cellular RTUs and routers to reduce operating costs and drive productivity. With a web-based console and customized dashboard, users are able to remotely access, configure and manage critical device information for several, even thousands, of Sixnet series RAM® cellular RTUs and IndustrialPro® SN routers from a central location. 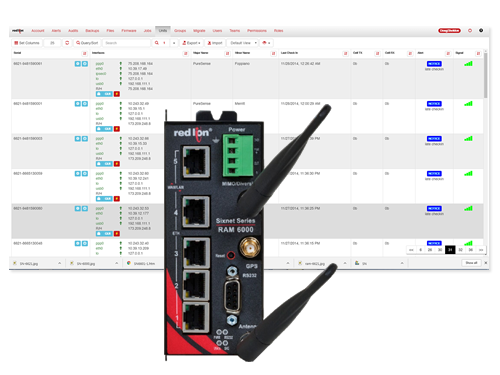 Key metrics— such as signal strength, data usage, connectivity, IP addresses and alarms—are displayed in real time to help simplify troubleshooting. Administrators can remotely set user-based access control parameters, upgrade firmware, configure VPNs and update firewall settings, thereby saving time and reducing maintenance costs.